"Ghouls are without a doubt the greatest evil, created only to devour mankind. Their lives depend on the act of killing; if they do not eat, they suffocate and eventually die. This plague that has been terrorizing us is at a decline. Several years ago, a Japanese and a German scientist worked together to create a weapon to defeat humanity’s natural enemy: the quinque. This is a weapon forged from a ghoul’s predatory organ, [url=tokyoghoul.wikia.com/wiki/Kagune]the kagune[/url]. Even today, the CCG (Commission of Counter Ghoul) and its investigators wage their war on the ghouls of their city." Ukaku users’ kakuhou are found on the shoulder areas, the kagune usually spreading like wings. The lightweight ukaku bestows upon the user agility and speed that the other kagune simply cannot. It’s well-suited for both long and short-distance combat. With it’s overwhelming speed, the ukaku can finish a fight quite quickly. The one problem is that releasing RC cells takes too much stamina so they lose the advantage quickly if the fight drags on for too long. Koukaku is a kagune released from below the shoulder blade, taking a metallic form. The kagune’s RC cells are bound together tightly, making it heavy yet durable as well as quite powerful. It’s speed is inferior to all other kagune but it’s durability is far superior. It can take the shape of shields or perhaps even part-armor when on the defensive and the shape of a sword, spike or other melee weapons. It is somewhat hard to use. The rinkaku is a kagune released from behind the waist. It’s shaped like scaled tentacles with the greatest brute strength, enough to smash through a koukaku’s shield after a certain amount of blows. Though the kagune itself is quite brittle and easy to damage but its regenerative abilities allows it to reconstruct itself quickly. It has a more liquified state than the other kagune. The bikaku is the most tricky one to deal with as it has no specific weaknesses like the other kagune. It comes out of the tailbone and, as one could guess, has the shape of a tail. It has decent offense, defense and speed, as well as capable of medium to short range combat. A kakuja is a ghoul whose attains an additional armor like kagune that increases the defensive ability, speed, strength and regeneration as a result of extreme cannibalization. After consuming perhaps hundreds of ghouls, the ghoul becomes a half-kakuja, sometimes unable to control himself/herself. The ghoul builds up RC cells by cannibalizing, which leads to this mutation. C: A rank given to weak ghouls, mostly average or below average ones. B: Slightly stronger than C ranks, though still not big threats. A: These ghouls are troublesome as they’re quite powerful, definitely stronger than an average investigator. S: Extremely dangerous, these ghouls can only be taken on by exceptional First Class investigators or higher. SS: These are the equals of most Special Class investigators, though some surpass even these powerful ghouls. SSS: The greatest ghouls, almost impossible to take down. These ghouls tend to be kakuja ghouls. A quinque’s properties are based on the type of kagune it was forged from, and is carried in the form of a suitcase or a bag. A koukaku quinque would be heavy and strong, usually made into big blades, shields or axes. An ukaku quinque is light and also suitable for long distance combat. A rinkaku is brutally powerful yet brittle, and again, bikaku has no weaknesses or strengths that stand out. A quinque can keep its "kagune" form. 3rd Rank Investigator: Investigators that haven’t attended the CCG academy, these investigators’ strength can vary quite a bit. These investigators aren’t given quinque. 2nd Rank Investigator: Either investigators who graduated from the CCG academy or those who were promoted. Being a 2nd Rank investigator doesn’t show strength since anyone who simply graduates becomes one. 1st Rank Investigator: These investigators tend to be quite powerful and have mastered the use of their quinque quite well. First-Class Investigator: First-Class investigators are usually paired with either 2nd Rank or 1st Rank investigators to mentor them. They themselves have great prowess in combat. Special-Class Investigator: Investigators feared by even the strongest ghouls, Special-Classes’ names are infamous even among CCG members from other countries and the ghouls. CCG: The ghoul investigators. 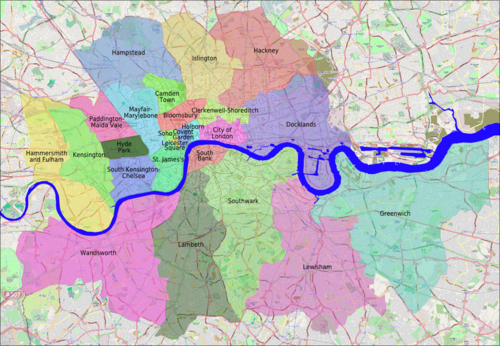 They have bases in every district, though their main headquarters are in the City of London. Mugg’o’Jo: A pleasant ghoul owned coffee shop at the South Bank. The owner of the coffee shop, a middle aged man named Joseph, manages the district and takes care of ghouls who ask for shelter. There have been no investigations or suspicions concerning the coffee shop. Ghoul Restaurant: The owner of this venue is unknown; what is known is that it’s a rather festive place for more sadistic ghouls. House of Pallid: This aggressive organization has had much activity in Greenwich, slaughtering the investigators there. Their leaders are unknown to all, as well as their motives, even the majority of the members. No OOC in the RP thread. Write "Lost World" somewhere in the app so that I know you read the rules. No sexually explicit acts. Keep this PG-13. Violence shouldn’t be too explicit. So don’t carefully describe how you eat someone, alright? Romance is encouraged but make it realistic if you're gonna start something. Do not ARGUE with GMs. If you have an issue, PM me but do not persist on something if a GM has already given you an answer. *Coming Soon* Once a character gets enough influence, I will prepare the layout. Please sign up and enjoy this RP!! concept looks interesting, any idea where i might watch/read the original story for context on the background? IG_42 wrote: concept looks interesting, any idea where i might watch/read the original story for context on the background? www.mangareader.net/toukyou-kushu/ It's an incredible read. I don't think this is gonna get off the ground but you should definitely read the manga. It's absolutely amazing.